Too often, ideas that could make the world a better place are presented in sterile, analytical or judgmental ways, making people tune out or trigger a fear-based response. Through a mixture of improvisation and stand up techniques, Sustainable Stand Up brings humour to big, save-the-world topics, helping important ideas become human, extraordinarily memorable – and funny. Anyone can remember someone’s comedy routine about taking care of aging parents, or the pitfalls of urban cycling, but can’t remember the details of the most recent climate report or human rights report. Sustainability applies to a lot of topics. Climate change is one, but so is how we can engage with each other on a micro or macro level, how we can express love or dissent in better ways, or how we can create a more peaceful and equitable place. Improvisation, done properly, is a ‘love technology’. It helps people to connect, communicate and collaborate in generous and engaged ways, even when afraid. Apart from teaching a more positive, alive and meaningful way to connect ideas that matter, people on the SSU course put themselves into a situation that can strike fear into anyone’s heart… public speaking. If they can retain their positivity and sense of humour under these circumstances, they can do it anywhere. The project founder, Belina Raffy, took her first improvisation class and first stand up class in New York in 1996, as a way to escape her boring yet stressful job. Since then, she got an MBA in England, studied with some of the best improvisers on the planet, served on the board of the Applied Improvisation Network, and worked globally with hundreds of people working to save the world in their own way. For this project, she has assembled an amazing team including a two top climate scientists, a sustainability innovator, and an award winning musical comedian. 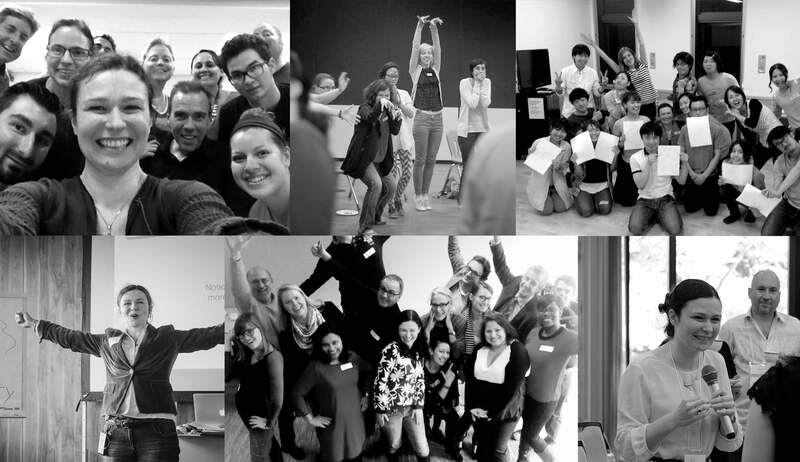 The global project runs courses in London and Berlin, with intensive short courses popping up in various places including Ljubljana, Shanghai and Tokyo. Online courses are also offered. The team would like to start setting up collaborations between stand ups and experts, for public shows as well as for some of the big, dry sustainability conferences. Comedians are among the few people with the right to tell the truth. The more Jon Stewarts, Trevor Noahs and Bassem Youssefs we can create, the better off we’ll all be. Don’t burn out at the enormity of the plight we’re in. Regain your sense of humour – and stand up for things that matter. Literally. Learn more about the in-person course and online courses here. Empress of Maffick. Big Cheese of Sustainable Stand Up. Global Captain of the Thrivable World Quest. Smile fairy. Tags: Awareness raising, Communication, Community, Democracy, Education, Empathy.